The women planned carefully, but there was no rush. Jesus, after all, had been dead since Friday afternoon. Faithful to God’s command, they rested on the Sabbath — sundown Friday to sundown Saturday. But they didn’t hurry to the tomb at nightfall Saturday. Maybe it wasn’t safe for a group of women to be on the streets of Jerusalem after dark. Or maybe they just knew: he would still be dead, in the tomb, on Sunday morning. They had followed him in his ministry, two Marys, one Joanna, and others unnamed. They had started in Galilee but then went everywhere else he went. And they had been the most faithful at the Cross. And when Joseph of Arimathea claimed Jesus’ body (strange the way Jesus’ earthly life was bracketed by men named Joseph and women named Mary) they followed again, watching to know for sure where he was lain. They volunteered to take on the responsibility of caring properly for the body of this man they loved. They prepared the spices that were needed for burial — maybe gathering them was what they did Saturday evening, once Sabbath was over. It was their responsibility as his community of faith. It was their act of love. 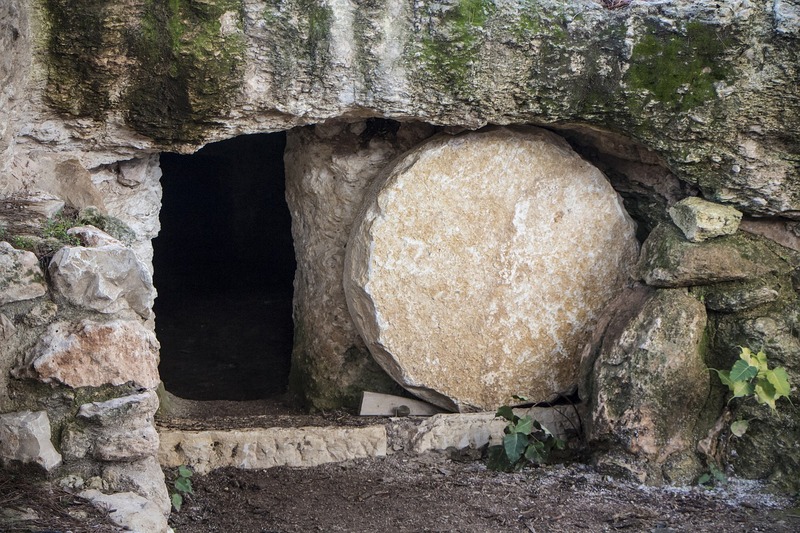 When they got there, though, to this tomb they’d seen, where they had watched Jesus’ body sealed behind a great stone door, it was all wrong. They didn’t even have time to wonder how they would find someone to roll that great stone away. Had someone done this for them? No: No one knew they were coming. They stepped to the door, through the door, up to the bier that had held his body. But there was no body. Just the cloths that had been wrapped around him. Who had taken Jesus naked body? Grave robbers? Soldiers? The Council? Nothing made sense. Every possibility was ghastly. Their heads were spinning. And then the place was full of light, brighter than if they’d brought lamps. They gasped when they saw two men with light beaming from their clothing. They knew the drill. They had to be angels. It was better news to the women — even if it took some explaining. The angels did explain. Jesus had risen from the grave. Remember? He had predicted the whole story that unfolded in the reading of Passion Sunday: Betrayed, handed over, tried, crucified, and now risen to life. It was God’s choice to give the news to these women first — these who were so faithful in following despite never being in the limelight; these women who were braver, and more dutiful than the men, coming with their spices to prepare his body. Orthodoxy does a much better job of honoring them than does my native Protestantism. The Orthodox call them the “Myrrh-Bearing Women” and they sing of them often. were hastening to Your tomb lamenting. And that’s just one of several hymns they sing, pretty much every week, about these women who were first to receive the news of the Resurrection. Personally I find that beautiful — and highly appropriate. Honor where honor is due. Unlike in Mark, in Luke the women did exactly as they were told. They rushed back to where the Apostles and others were cowering in grief and fear, and told them what they’d seen and what the angels had said. In a way, this was the first proclamation of the complete Gospel. It wasn’t just a call to follow Jesus. They had news: Jesus has conquered death by death and now he’s alive again! New life for all has begun. I don’t believe you for a minute. In short: The whole community of faith blew them off. And so, perhaps we should not be surprised when the world does not receive our Good News either, at Easter or any other time. It seems so unlikely that Jesus who died would live again. It seems so contrary to observation that death is conquered, that new life has begun. But we should look more closely: This tendency to blow off the Good News and its messengers is something we Christians do, just like our Apostolic leaders. We don’t grasp the significance of the Resurrection most of the time. Even if we say we believe it, we hold back from living into it — or can’t figure out how we could. It takes some doing to get a grip on Easter, the empty tomb, this whole Resurrection business. Luke shows us this: In his entire narrative of Easter morning nobody has the singularly clarifying experience of actually meeting the risen Christ. But while the rest simply disbelieved the news of the myrrh-bearing women, Peter was at least curious — Peter, who had denied Christ three times despite his bold words at the Last Supper. Jesus had told Peter that, when he came back to faith, he should build up the others who had also fallen away. He’s almost ready to turn back to faith now that he’s heard the women’s news — almost. He has to know. So he runs to the tomb. Yes — empty, just as they said. No angels though. Just linen grave cloths. He wants to believe — and he almost does. And Peter’s response is worth taking as our own model. We hear this extraordinary news much more than second hand. It is hard to believe. We too need to do what we can to check it out. Then we need time to weigh it it, to take it in. Some tell us Jesus is risen. Time to get away, go home alone, and think about it. I’d love to send you all my Monday Meditations (as well as my other new articles and announcements). Scroll down to the black box with the orange button to subscribe and they’ll arrive in your inbox most Fridays. I found the fact that the angels did not say “fear not” refreshing. I have often said I dont want any angel who is directed to visit me to say fear not because if the angel says fear not, there is good reason to be fearful.